Today we’ve got a fairly rare Disneyland gate flyer from December 17, 1961. This large and detailed flyer was for Disneyland's presentation of the “Christmas in Many Lands” parade. Where did they keep all these people, floats and stuff? 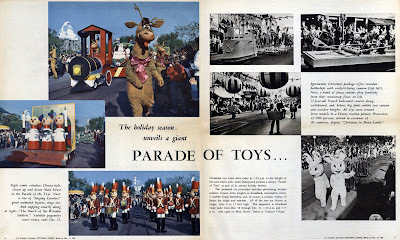 “The Parade of Toys” parade featured Ed Wynn and Tommy Kirk riding in the fire engine! Christmas in Many Lands was held on December 17th as was the Candlelight Procession, the “Living Christmas Tree” (what was that?) and Christmas Trees Around the World display (at the Pavillion?). Lots of special event dates, times and locations if Jason is still out there. 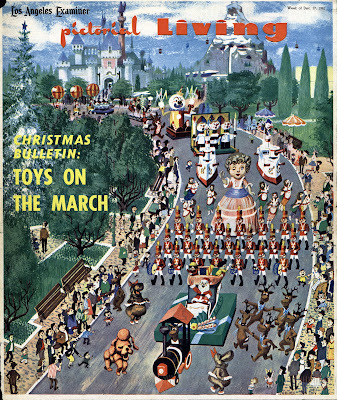 Disneyland’s “Toys on the March” was featured in the December 17, 1961 edition of the Los Angeles Examiner “Pictorial Living” insert. Nice two page article about the parade with some great color photos. For all of you hostesses who dream of enjoying your own parties as much as your guests, here are some great tips and recipes. Brandynog is simply “enhanced” eggnog, enhanced at 80 proof. I'm pouring a glass for the Major right now, anyone else? 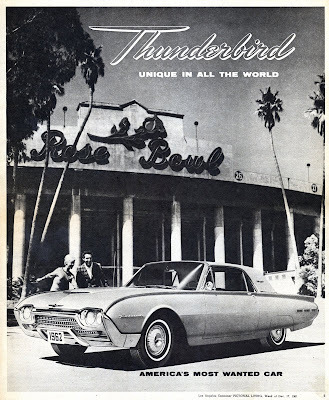 The all new 1961 Thunderbird was indeed “Unique in all the world” – also a favorite prop of Rod Serling. Come back tomorrow for a special TRON show & tell post. Looks like you're starting to delve into the rare stuff! I have one of these, but it's in terrible condition. I think I've decided I want to live in the early sixties for the rest of my life. These are the parades I remember (and love... I haven't seen a modern D-land parade in years) and industrial designers had 50's garishness under control. It bothers me that in a blink it was all swept away by the fruitcake 70's. The Living Christmas Tree Choir is still part of Candlelight today. I'm jealous of the person who gets to be the star. 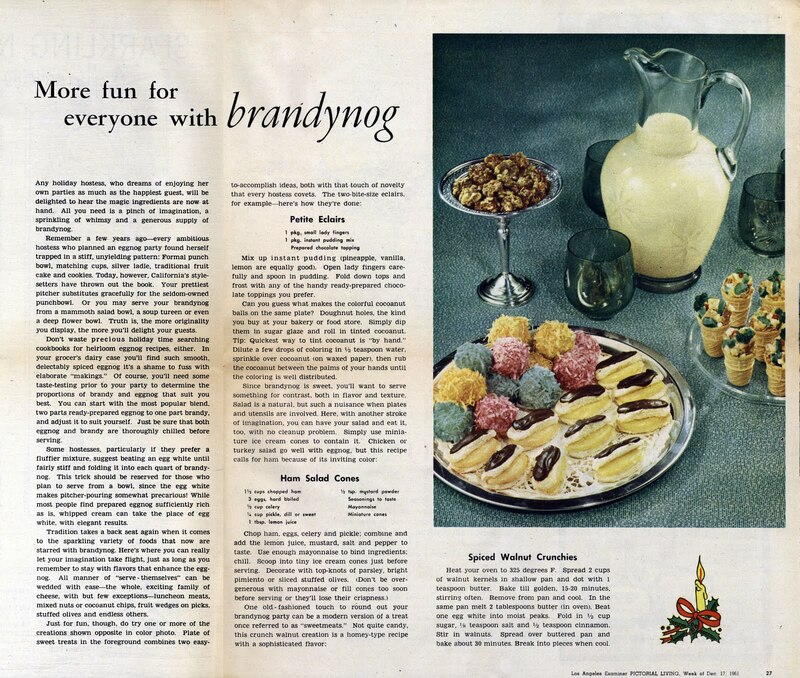 I would love a glass of your Brandynog, please. It sounds like it could be the name of a river or mountain range in Tolkien's Middle Earth. I have a copy of the 62 flyer and the cover has a green wreath! As usual, I love your blog more than just about anything.